Never been to Salute before so this year I though I would go and see what the event was like.There was also a painting competition for which I grapped a few model from my collection. Two Femme Militant figures - Mary Bones and Cataphractii, and one of my own designs - Ragny Toadbreath. Arriving on the Friday I had a day in London which I spent in the Victoria and Albert museum. I also meet up with a few friends, and got some great food at Guakamamas as well as a late night coca cola in the newly built and extremely plesant cafe in the central court of British Museum. When I finally got back to the hotel I found a crowd of figure-painters and people from the industry - among these Sally and Kevin White who in the most polite way possibly complained that I haven't painted any Hasslefree Miniatures. Super-friendly people and the same goes for Andy Forster of Heresy Miniatures who was at the table as well. After a big breakfast which included cerial, 2 glasses of orange juice, croissants, fruits, tea and coffee as well as writing a postcard for my family I went over to the event around 11, where I stumbled into an old friend back from my year in Nottingham, Adrian Walters aka Chaos Child (his website). 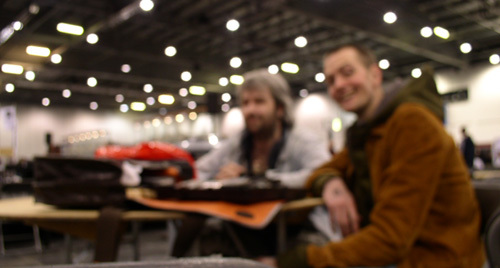 Here is a blurry shot of me and Adi looking at figures � somewho real people just cannot sit still as the miniatures I usually photograph. 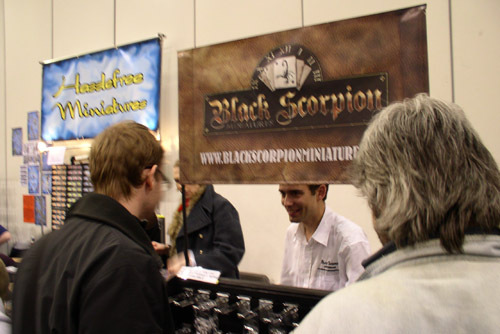 I found Adam Clarke's Black Scorpion booth in between Hasslefree Miniatures and Heresy Miniatures. Adam is a good friend and his new pirate stuff looked really impressive. Here he is hiding behind his company banner. Having mostly painted fantasy and SF figures and GW stuff myself the event had lots of stuff I didn't realise existed. 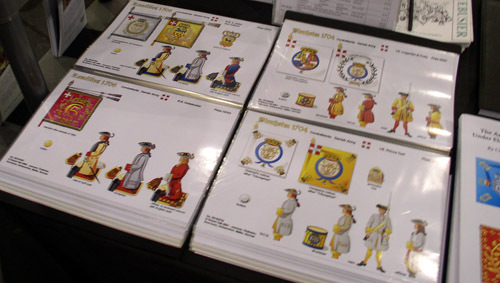 For instance the Pike and Shot Society that does these beautiful and informative minitary uniform sheets for different countries and periods. Here are sone Danes. I need to check out their website to order some. 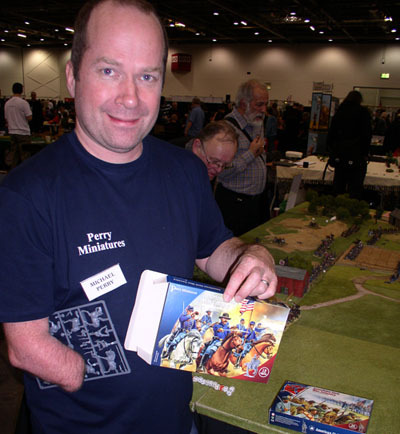 Speaking of historical miniatures I meet Michael Perry who was showing off the forth-coming Perry plastics and an impressive gaming table. 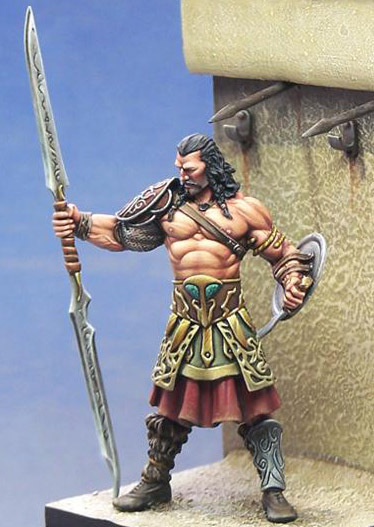 The sprues looked really nice and while Michael posed for the photo Alan was working away in their trade booth. Onto the painting competition. There was plenty of impressive stuff and I was told that the standard had gone up a lot this year. When Adrian showed me his stuff I was really impressed and he also walked away with two 1sts and 2nd overall. Nigel Carman won overall and got the goblin sword with an entry I unfortulately didnt get a chance to see. And as I had somewhat expected I didn't place with my two very Gwstyle-ish entries and the little gobbo witch. My camera acted weird during the ceremony so here instead is a picture showing one of Adrian's winning models. After Salute I went up to Nottingham and visited a friend from my 'Eavy Metal-days, then and caught the plane back from East Midlands late Sunday afternoon. 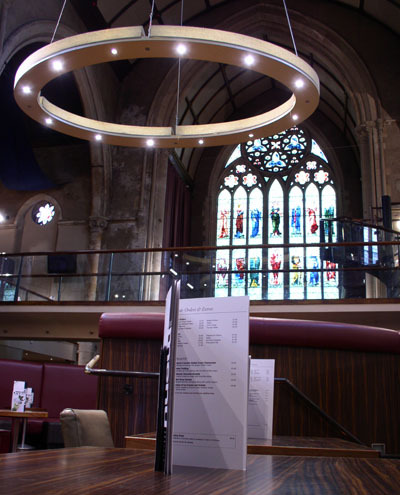 Had lunch in a former church now used as a bar and restaurant -a nice place that I always enjoy coming back to (picture further below). Overall, I really enjoyed the event. Especially because of the lack of tension for my part in regards to the painting competition since I hadn't really prepaired anything on the scale that I usually do for Golden Demon. This, as well as meeting painters, looking at figures, museum-visits, and seeing friends made the whole trip very pleasant and enjoyable, and I returned to Denmark inspired and ready to try out some new colours and ideas � The Golden Chef painting competition arranged by Black Scorpion Miniatures might be a perfect occasion to get somethig done over the next two weeks.